Frank Zappa was one of the most individual figures in American rock music. With wit, sarcasm and great musical skill, he went his own way, well out of the mainstream. First with the Mothers of Invention in the 1960s, then leading bands under his own name, he pushed the boundaries of rock (and sometimes good taste), and also worked in classical music until his death in the 1990s. Although never a best-selling figure, his fans were devoted, and since his passing more people have come to know and appreciate his music, making him into a cult figure – which can be ideal for collectors of memorabilia. The first thing to consider is what’s available. You can find autographs for around £100, either from dealers, or sometimes on eBay (although, as always with eBay, you need to be certain the item is authentic). 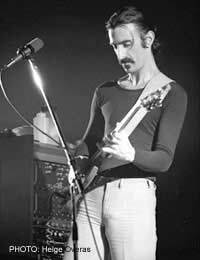 The fact that Zappa has cult status is a double edged sword. It makes items extremely collectable, but at the same time, most prices haven’t gone through the roof because of his limited popularity. When Christie’s auctioned one of Zappa’s paintings, it was only expected to realise between £2,500-3,000, a small figure compared to other musician-artists. But it’s the music that draws fans, and anything directly involved with that can bring money. An acoustic guitar case he’d used (just the case, not the guitar) sold for £800, and in 2002, Zappa’s son, Dweezil, jokingly put up one of his father’s guitars for auction on his web site with a starting bid of £500,000. In a real auction, a Gibson Les Paul that Zappa had customised and used regularly in the 1970s brought several thousand pounds. Some Zappa posters sell for surprising amounts at times. One dealer was offering a rare one from 1971 for more than £1,500. At the same time, you can find others for less than £50 – it depends on a number of factors. Unless you seek specific posters, it can pay to look around several dealers, and even eBay, to compare prices. Don’t expect to find clothes, or personal artefacts. Those have been kept by his family, and are unlikely to ever be offered for sale. It’s very rare that you’ll find Zappa memorabilia at one of the big auction houses. By and large, there’s not enough money to be made from him to justify it. However, smaller auction houses and online auction houses love him. You can find some smaller items of Zappa memorabilia on eBay, although the usual warnings about authenticity apply. You might also find some collectors selling off items, but these will likely be Zappa devotees rather than dealers. However, these kind of sales only occur rarely. People who buy Zappa memorabilia tend to do so as collectors, rather than investors. Although items are likely to rise in price over the years, the biggest question is how large a market there can be. For investors, he’s probably not the best bet, since he’s unlikely ever to be more than a niche figure, so there’s little profitability in him.